Recently, I have been faceting larger gemstones and more non-gemstone materials due to my clients’ desires. I was excited to hear that ULTRA TEC was developing a new faceting machine, the Glass Tec, for the glass artist, and I was quick to order one. I am delighted with my new Glass Tec and have been using it to facet both glass as well as large quartz gemstones. 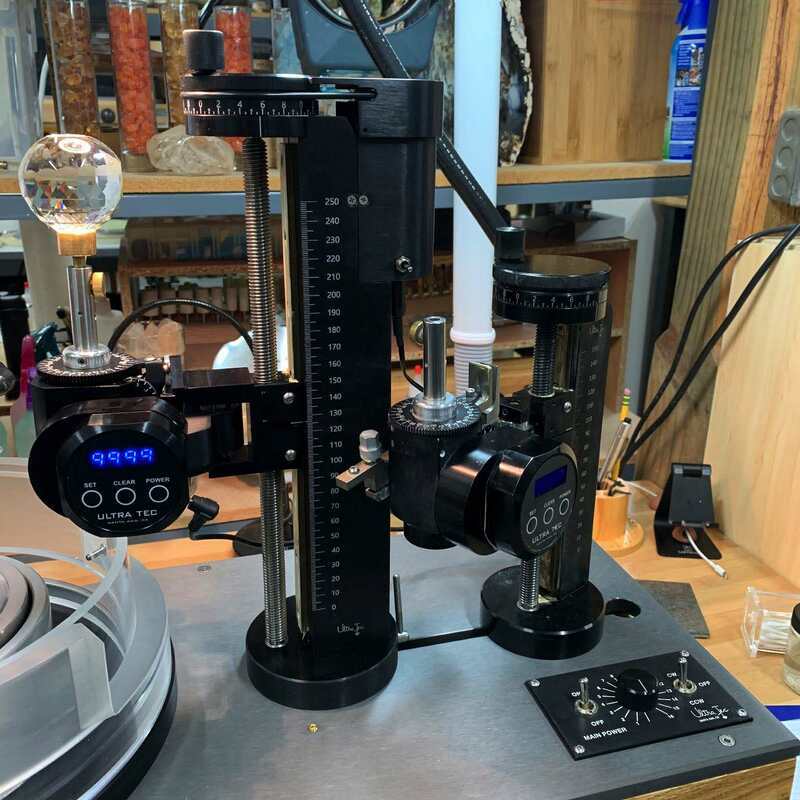 I have received many inquiries about the machine as well as questions about the differences between the Glass Tec and the V5 faceting machine (ULTRA TEC’s gemstone faceting machine). This article aims to answer these questions. The first thing you notice about the Glass Tec is its size. It is definitely built to facet larger objects, such as glass and larger gemstones, with no compromise to the ULTRA TEC quality. ULTRA TEC built in the stability to handle larger objects without sacrificing the precision that is required to facet a fine gemstone. I will proceed by comparing the Glass Tec components with the well known V5 faceting machine. 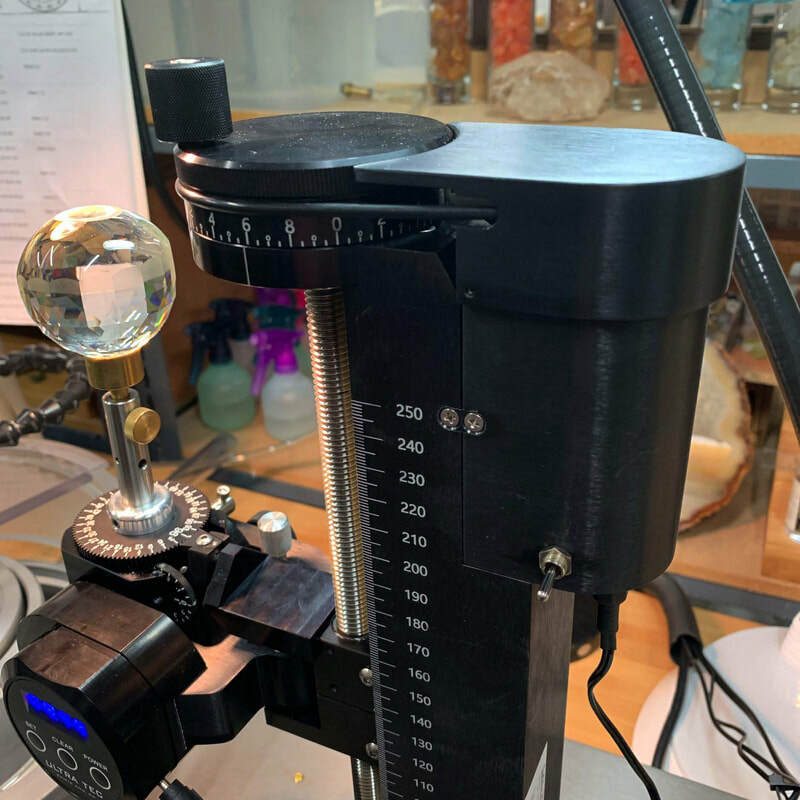 Please keep in mind that I think the V5 faceting machine is the best gemstone faceting machine on the market and is what I use daily to facet fine gemstones and teach faceting students. Whereas the Glass Tec can facet fine gemstones, its size and features are specifically engineered for the glass artist as well as allowing the gemstone artist to facet on a grander scale. The base of the Glass Tec requires a larger footprint on your worktable. It is 6” longer, 2” wider, and is the same height as the V5. 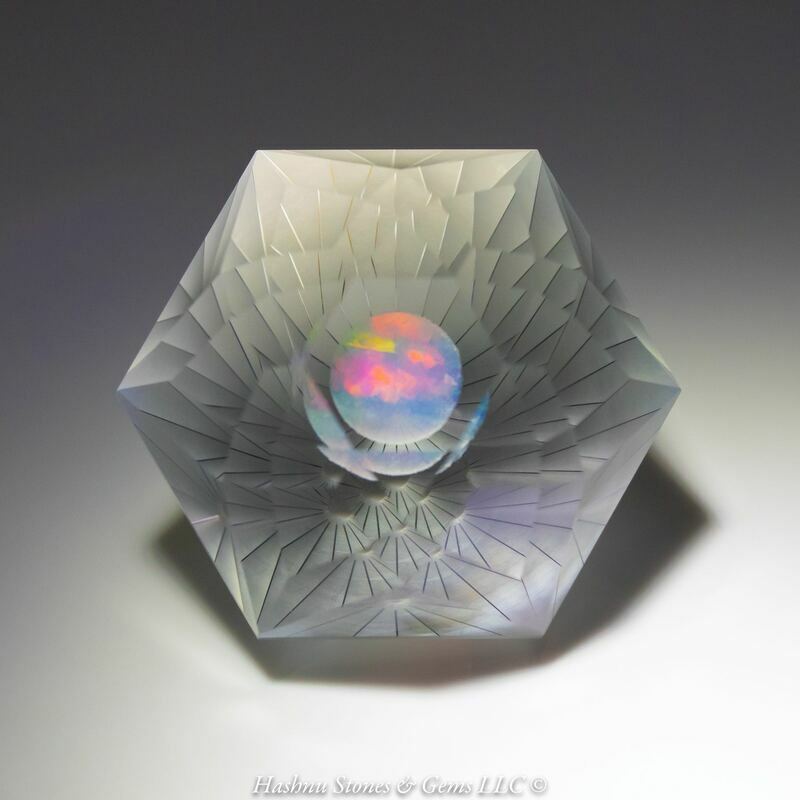 This larger base is necessary to accommodate the larger splash guard and mast which is the basis for being able create faceted glass objects of considerable size. The speed controls are the same as the V5. The panel gives you the on/off, clockwise/off/ counter clockwise controls for your lap direction and variable speed control. The first thing I noticed about the platen is that it is 1” higher than the V5. This was designed with the purpose of being able to facet negative angles. Whereas a traditional gemstone girdle is faceted at 90 degrees and then transferred to facet the other side, the Glass Tec allows you to go beyond the normal range and facet negative to the flat horizontal. This is very convenient for glass works that you are not going to transfer because it allows you to keep the punty attached while adding facets to the bottom of the piece. *In the gemstone world we call the cutting tool a flat lap, while in the glass industry it is called a wheel. I will be using the term lap throughout the article. 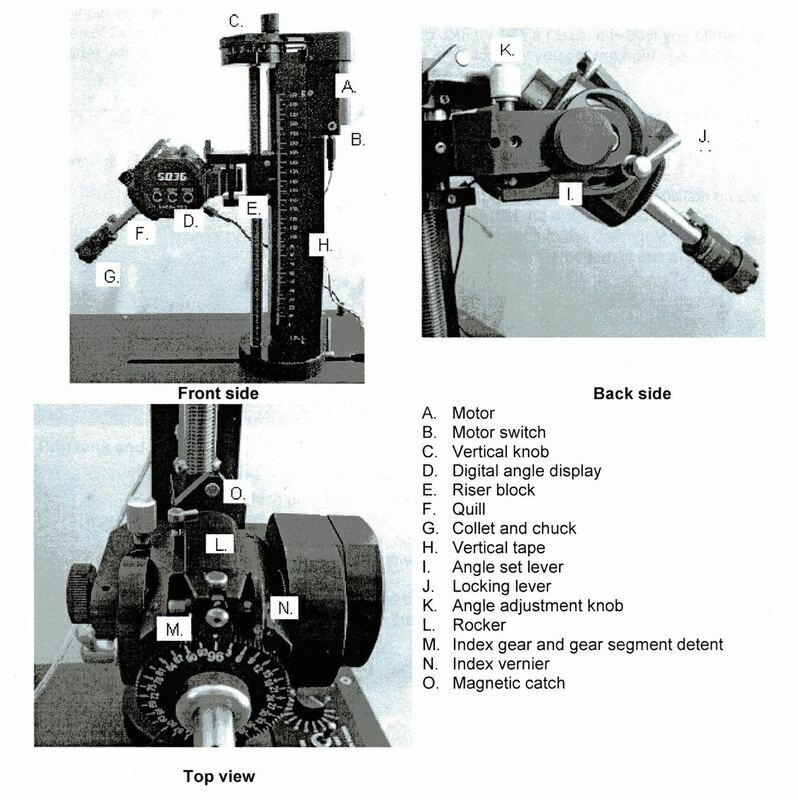 The motor and drive setup are the same on both machines. 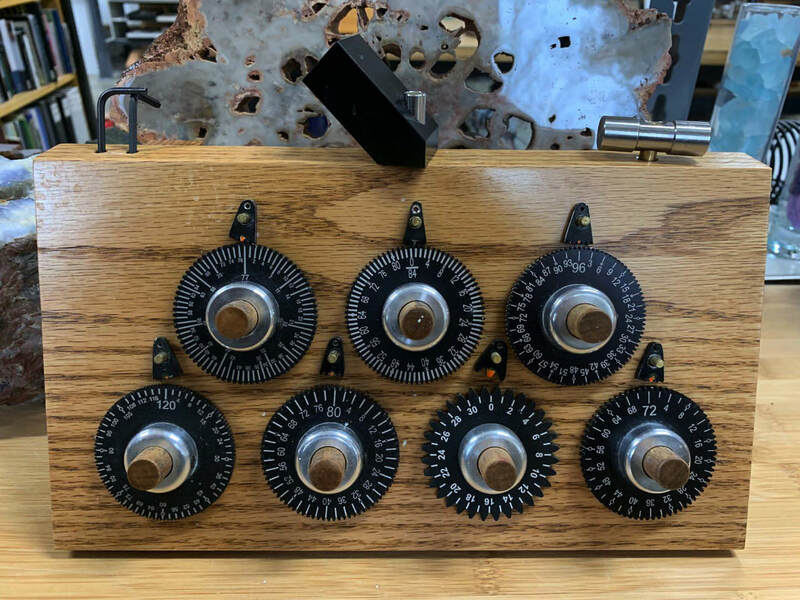 Given the softness of glass compared to gemstones, I find myself working at slower speeds on larger pieces and the motor and drive mechanism has more than enough speed and torque to handle everything I have tried. The splash guard is the most noticeable visual change in the Glass Tec. It is a four-piece plexiglass splash guard that is as functional as it is striking to look at. The base of the splash guard has two posts and the drain extension that holds the guard firmly in place. The side piece has a 90-degree opening to allow for plenty of room for working at lower angles. There is an insert to the base that rotates smoothly to allow access and when it is fully closed, prevents splashing from the lap. There is also a removable lid for the splash guard that allows you to be aggressive in the initial roughing in of your piece without sending water and swarf throughout your studio. The Glass Tec splash guard will not fit on a V5 machine. The safety nut on the Glass Tec is a screw and two metal sleeves that are tightened with a hex wrench to secure your lap. The idea behind the new safety nut is to provide a lower profile so you can use the splash guard lid. The Glass Tec drip tank is the standard one that comes with the V5 and is one component that I recommend that you upgrade during your order. I highly recommend ordering the Faucet Kit as a replacement to your drip tank in order to expand your reserve capacity from one quart to three gallons. This gives you the ability to be generous with the water and spend more time faceting without replenishing your water supply. The draining system has a larger diameter for removing your water and swarf quickly without clogging. The base comes with an attachment for Moffatt Flex task lamps. I recommend a 24” flex Lamp for better height and coverage of the larger machine. The V5 mast block is 1” thick by 1.5” wide and 8” tall, while the Glass Tec mast block is 2” thick by 2” wide and 12” tall. This provides a very stable backbone for the mast unit while allowing for 4” more of height for faceting much larger pieces. The additional height of the mast along with the longer base mast lot (3” longer) gives the glass artist the room to create substantial glass creations. The vertical knob on both machines are identical. The main difference is that the Glass Tec has an electric motor and O-ring that attaches to the vertical knob to make lowering and raising your work easier and faster. To be honest, I disengaged the motor by removing the O-ring early on during my initial use of the Glass Tec, given that I was not used to it. However, after faceting several pieces, I have reengaged the motor and I am enjoying its capabilities. The various indexes available from ULTRA TEC are interchangeable between both machines. Both machines come with a 96 index. I recommend ordering different indexes after you facet a few pieces if you are interested in different symmetries. The rocker to raise and lower the segment from the index gear is a whole new approach. Instead of lifting upwards in the front for the V5, you press downward in the back for the Glass Tec while changing your index during faceting. At first, this was the most alien thing about operating the Glass Tec for me, but once I got working, it became very natural. My fingers do tend to get jumbled up when switching between the V5 and Glass Tec, but after a couple spins, I am back into the groove. 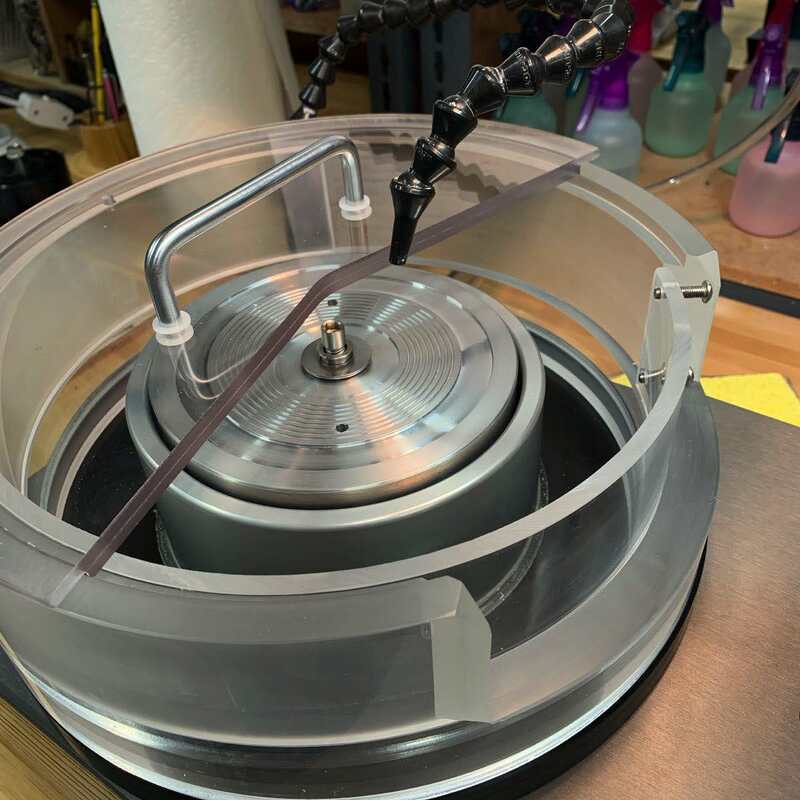 No doubt that long time users of ULTRA TEC faceting machines will find this a little challenging, but if you are new to faceting, you will find this a perfectly natural motion. could be problematic if it moved unintentionally because it was too loose. This is one new feature I would like to see in all future machines. The free wheel latch allows you to lock out from your index and freely rotate your piece around. This is beneficial when looking at your work from different angles and creating advanced designs. It makes sense, given the rocker is different on the Glass Tec, that the free wheel latch would also have a new design. In this case, the latch is both quicker and easier to engage. Here is another design change that I am looking forward to in new ULTRA TEC faceting machines. On the V5, you adjust the angle set lever by tightening a screw but on the Glass Tec, the screw has been replaced by an integrated lever. When I first started using the Glass Tec, I was amazed at how natural this new modification felt. Not only did it feel better, but the result was a more accurate during the initial setting along with a tighter application of the angle set. The angle DAD on both machines are the same. The quill is the same on both machines. The Glass Tec comes with a chuck/collet based quill adapter for accommodating larger dops or calibrated punty. It comes with four sizes, 6, 10, 12, and 13 mm. Additional sizes can be purchased. A completely new addition to the Glass Tec is the dampening knob which allows the quill to be locked throughout its range of vertical motion. The dampening knob is especially useful for locking the work in a set position for extend breaks. I think there may be some other uses for the dampening knob in regard to creative faceting (I will let you know what I discover). engineering, and development of the Glass Tec. 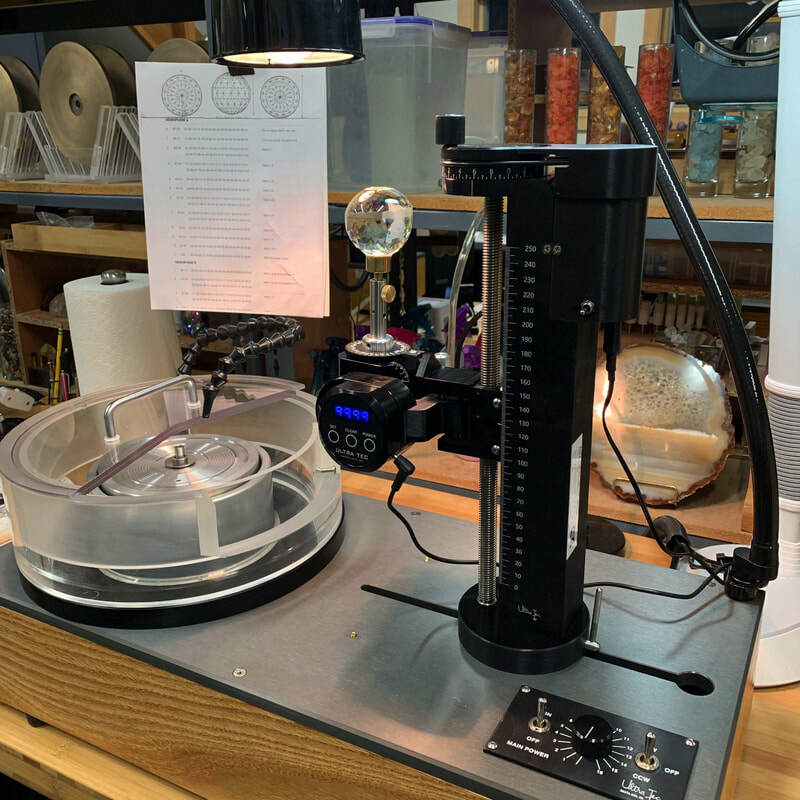 At first use, it becomes apparent that they used their past fifty plus years of gemstone faceting experience in creating this “Hercules” of a faceting machine. Everything is both rock solid and precise with also new and easier ways to control the faceting process. Let’s hope that we will see some of these new features in the ULTRA TEC faceting machines in the future. Hashnu Stones sells and provides training for ULTRA TEC faceting equipment.